Located in Thonburi, Bangkok's Central Business District, The Royal City Hotel offers an outdoor pool and 24-hour room service. It also has a sauna and traditional Thai massage services. Suvarnabhumi Airport is about 45 minutes' drive away. Air-conditioned rooms are fitted with floor-to-ceiling windows which present beautiful city views. All come with a cable TV, minibar and tea/coffee making facilities. En suite bathrooms are equipped with hot-water showers. 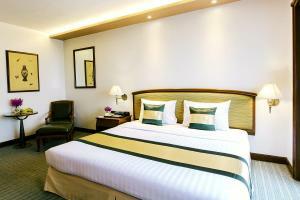 The Royal City Hotel is within 3.5 km from National Museum, Royal Barges and Khaosan Road. Other attractions like the Grand Palace, Wat Pho (Reclining Buddha Temple) and Wat Phra Kaew (The Emerald Buddha Temple) are about 5 km away. Same-day laundry and dry cleaning services are available for guests' convenience. The hotel also provides a shuttle service to shopping areas, as well as free parking. Krua Khun Chai restaurant serves an international buffet breakfast spread, while the 24-hour Garden Cafe Restaurant offers Continental dishes. Other dining options include Cheiw Tien Lao Chinese Restaurant, Lobby Lounge, Beer Terrace and Pool Bar. Rooms are all smoking rooms unless requested otherwise at time of booking. Air-conditioned room features floor-to-ceiling windows with beautiful city views. Comes with 2 single beds. Air-conditioned room features floor-to-ceiling windows with beautiful city views. Please indicate at time of booking your bedding preference, subject to availability. Rate: THB 2400.00 ... THB 3300.00; select dates below to get current rates. Spacious suite comes with a separate living room and a dining area.